Do you know about my 360° project? The first post can be found up there [POINTS NEAR THE TOP OF SIDEBAR]. Essentially, I'm noticing the good I give and the good I receive. Nothing earth-shattering. Nothing spectacular. Just trying to notice what goes around, comes around. In a sense, I guess that's saying "yes" to optimism. 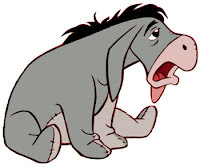 Given that I'm such an Eeyore, that's saying "yes" to quite a bit. 11°: Took a fellow classmate of Youngest’s to and fro the first basketball team practice Friday night. His parents already had other plans when the coach contacted all of us on the team. 353° and 352°: Driving that boy and Youngest home from basketball team practice Friday, I got pulled over by the local police. The cop approached my car, having first called in the license plate to make sure I was, in fact, a soccer basketball mom and not, you know, something more sinister. When he asked for my license, I opened up my wallet and noted the $20 bill in it. “That is not a bribe, sir. That is merely a loose $20 bill that I’m moving to get my license.” “Times are bad, ma’am,” he said. “But they’re not that bad.” First degree? He could take a joke and didn’t arrest me for attempted bribery. Second degree? He told me the Jeep’s right tail light was out and that I should get it fixed, but he didn’t give me a fix-it ticket. You get extra points for the funny joke.